Let's learn by doing. Let's learn by getting incredibly confused. The way this will work is we will ask you to input some code into the console and make things happen right on this page. If you're worried something got messed up, just hit the reload button on your browser and it'll all be washed away. One tip: if something returns undefined, that doesn't mean it didn't work. It just means it didn't return anything. 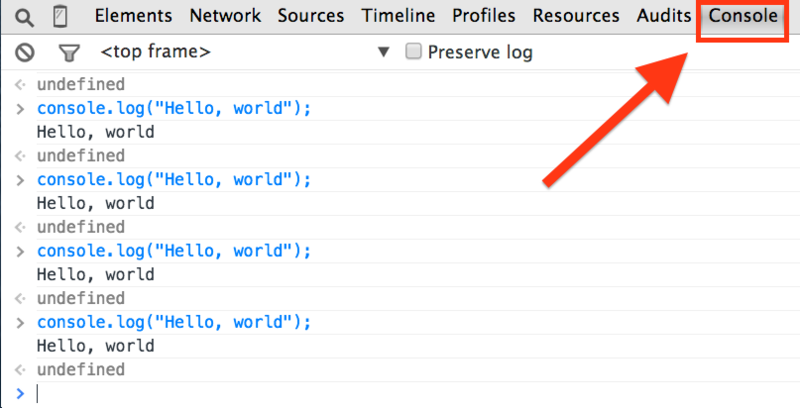 First, go into the console and input console.log("Hello World! ");, then hit return. When you get multi-line instructions, use a SHIFT+ENTER rather than a carriage return between each line so you don't get errors trying to execute half a function. We highly recommend you actively type these in rather than copy-pasting, because muscle memory matters. Try to guess what's going to get output in each one before it runs, and feel free to play around with this stuff further! Cool! You just made something happen in the console and in the browser! When you declare a variable for the first time, make sure to start with the var keyword. You're going to learn why in a couple lessons. Also, notice how common those parentheses and semicolons are. We promise you will understand how these functions work soon enough. For now, see what you can infer from the oddly broken English of the code and its result in the console. You Can't Have Functions Without "Fun"
First, input these in one block as mentioned before. For once, you can copy-paste it if you're having syntax problems. Then, input the following commands, one by one, looking at the results after each line. Try to guess what you'll get for each one. So you can get the browser to output the text of the function you're referencing, and the parentheses are the trigger that makes it actually fire. This knowledge should come in handy later when you have a broader picture of how the language works. Here's a lazy button that doesn't do anything yet. Let's give it something to do. There's a lazy span right under it that doesn't do anything either. Input this chunk of code into your console, though, and things will be very different. As a bonus, notice the syntax of if statements. lazySpan.innerHTML = "Button has been clicked " + clickCount + " times!" Needless to say, see what happens if you click that button 25 times. Any guesses how this thing worked? Lots of this probably feels strange and scary. That's okay; the following unit will begin to put all the pieces together. From here on out, whenever an example seems too abstract, type it into the console and watch it play out before your eyes. Before you go on, here's a little bonus that shows you how things can go wrong if you're not careful. Don't type it in until you're done with this page, and get ready to hit the "refresh" button afterward.